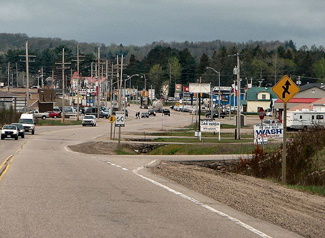 Sundridge is a village of about 1000 people strewn along the east side of Highway 11. Established in 1889 on the shores of Lake Bernard, Sundridge is a former lumber and rail town that now finds itself as pretty much the northernmost extent of southern Ontario cottage country. One my highschool teachers left their job for a high school in Sundridge, apparently for the solitude and seclusion. Let me tell you, if you’re looking for quiet and minimal company this is the right place. 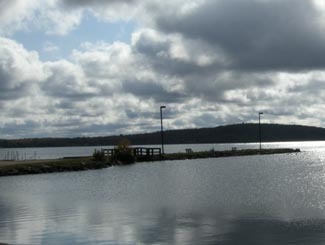 Sundridge is small and, for a southern Ontario town, situated pretty far north. Sundridge is kinda funny because it’s a name no-one really wanted. 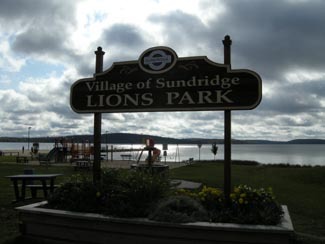 Originally the town was supposed to be named Sunny Ridge, but when they applied for the name in the late 1800′s Canada Post made a mistake and registered it as Sundridge. As long as the mail came it really didn’t matter, so it stuck. The Sundridge that most travellers see is a relatively nondescript rail crossing on the highway with some truckstops and a factory or two on Highway 11. However if you turn into town you’ll find that although tiny, Sundridge isn’t half bad. There is a nice little waterfront park with a playground and a little beach on Lake Bernard. There is a “resort hotel”, a few car dealerships, a grocery store, a LCBO, and a Legion, along with a few other stores like Home Hardware. 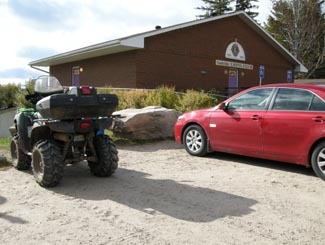 There is Ten Gables Golf Course, fishing charters, and snowmobiling, icefishing, and sugar shacks in the winter. Sundridge also hosts an Agricultural Fair in the fall. Sundridge made national news in August 2008 when the employees of the local Ford dealer won half of Canada’s second-largest lottery jackpot ever. Twenty-five people split 22.5$ million. The owner said that he didn’t expect to lose anyone to retirement right away…they must be a really dedicated lot. Being in cottage country means that Sundridge has a few more amenities than its neighbours to the north. There are five bed and breakfasts (Lakeview, Maple Sugar, Mitchell’s, Belrose, and Entwood Forest,) the Relax Shack Retreat, Allenby Cottages, a trailer camp, and a few motels. For food there is Danny’s Justa Pasta a bit south of town, Double Decker burgers, Ha’s Chinese, a deli, a café, and the Stieirhut Schnitzel Haus (which I’ve always wanted to try, but never have – I love schnitzel). I had a good breakfast at Jim and Elsie’s Café. In town I also bought the most stale, overpriced croissant ever – I didn’t know that the price of croissants was indexed to the price of gas to rise as you go up the highway. ATVs parked right beside cars like it’s normal? You know northern Ontario is beckoning…! This entry was posted in Muskoka and tagged boating, festivals, hockey, waterfront by Highway11.ca Editor. Bookmark the permalink. Sundridge is 2 1/2 hours from TO only if you are speeding. OPP will frown on that from Barry or Orillia. Do not recommend, or it may end up taking you 4 hours. Sundridge is beautiful! I grew up there and it was the best childhood experience anyone could ask for.The people have the biggest hearts!!! The dealership you were talking about is called Bray and it sells GMs not Fords. I can highly agree, this is a very beautiful town when I visit for two weeks. By the way, the total time from NJ to Sundridge is over 12 hours by car, so don’t complain. Sundridge IS 2 1/2 hours from toronto. When we drive to our cottage, my dad can make it from Hamilton to Huntsville in just over 3 hours and to Sundridge maybe half an hour after that. As for restaurants, there\’s also the Blue Roof. My cousin\’s girlfriend works there. I agree, Sundridge is not 2 1/2 hours north of Toronto, though I can make it to Allenby Cottages (wonderfully affordable, rustic cabins right on the lake) from Barrie in 1 3/4 hours and that is driving normally, often with a coffee break in Huntsville. Sundridge is a beautiful family spot. Great cottages and camping with a friendly town atmosphere and pretty much every amenity a person looking to escape the city for a week or two could need. Lake Bernard is excellent for families with kids. Lake Bernard is super safe due to the wonderful sandy beaches and shallow shoreline. Take a look at the lake from Google Earth and see what I am talking about. That white ring around the lake is shallow and warm water with a soft, sandy bottom. As an adult, from most beaches, you have to walk at least 50-100m before you get to deeper water. If you have never been to the area before, it is definitely worth looking into. For the extra 30 minutes or so of driving, it is way more affordable than most true “Muskoka” destinations.